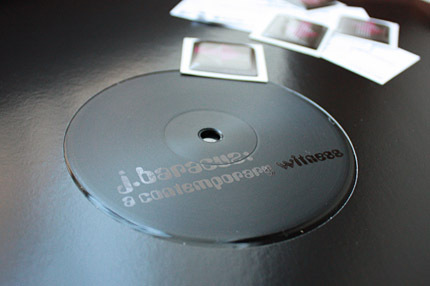 Due to popular demand, we could not resist to press J. Baracuz‘ 2011 digital release “A Contemporary Witness” on vinyl. So here it is again – this time on black gold, as we all love it the most. The six track EP successfully blends crackling samples and futuristic sounds with heavy drums and beautiful vocal bits, while focussing on modern sounddesign, delicate arrangements and complex song structures. Additional to J. Baracuz‘ four original tracks from the digital version, the 12″ comes with two awesome and brandnew remixes by Hamburg-based Skyence and Russian Damscray, who’s probably known best as one half of the producer duo Demokracy. The opening track of the 12″, “The Overture”, juggles with string and piano samples while it is underlined by percussive and driving beats. The tune is as much “on point” as the impulsive second track “One Way Ticket”. Regardless of the moderate tempo, the song is straight forward, includes vocal shreds and synth sounds und even manages to switch over to a Sci Fi Dub part in the middle. The track is followed by “Everyone’s The Same” which impresses with it’s beautiful female vocal samples and a melancholic Soul Folk Electronica Vibe. The flip-side starts with the remix by Skyence who has put hands on “The Overture“. With his detailed and more glitchy version he’s able to take the epic atmosphere of the original to another level. Next is the organic “Jazzy Conqueror“, the longest piece on the EP that was called a “Masterpiece” by French producer Fulgeance, one of our favourite beatmakers out there. Finally, Damscray leaves us behind with his version of “One Way Ticket“: An almost tribal dubstepish tune that sounds like an Aborigines underground party. Parallel to the very limited vinyl release there will be a free download version of the remixes that includes “The Overture“, both remixes as well as an almost forgotten edit version. After a creative break he spent with studying, travelling and digging for records, J. Baracuz has found his way home in 2011 and released his EP “A Contemporary Witness” on Equinox. Due to popular demand, the EP was re-released in 2012 on vinyl.